Dave Forester, Professional Guide, with our most popular guide, Christy. 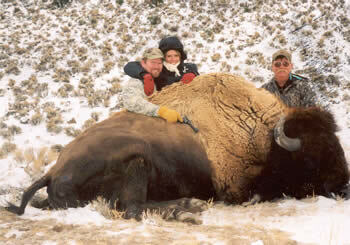 "We had an excellent time on our buffalo hunt with Thousand Hills Bison Ranch and John Morningsky Ray. Kristee and I both had a lot of excitement from the beginning to the end. Riding the horses in the beginning was exciting and scenic. We saw wild horses and had a great time with John on the trail telling stories and enjoying the expansive outdoors. Having my own lodge and fishing guide service in Alaska, I know how hard it can be at times as a guide. John is not only a great hunting guide and horseman, but also a great friend to have and spend time with on the trophy hunt. Thanks again, John!"